Is GoPro About to Face a Cash Crunch? The action-camera maker may need to take on some debt to bolster its liquidity. Shares of GoPro (NASDAQ:GPRO) sank to fresh all-time lows on Monday, following an analyst downgrade (via Tech Trader Daily). Goldman Sachs analyst Simona Jankowski dropped her rating on GoPro from neutral to sell, while simultaneously slashing her price target down to a mere $6, or about 30% lower than where shares closed on Friday. Jankowski lays out a handful of concerns, including saturation of its core niche market of action cameras as well as meaningful increases in costs in recent years as the company attempts to drive future growth. GoPro already reported in early February that it had a slow fourth quarter, which left it in a precarious inventory position as units gathered dust on store shelves. 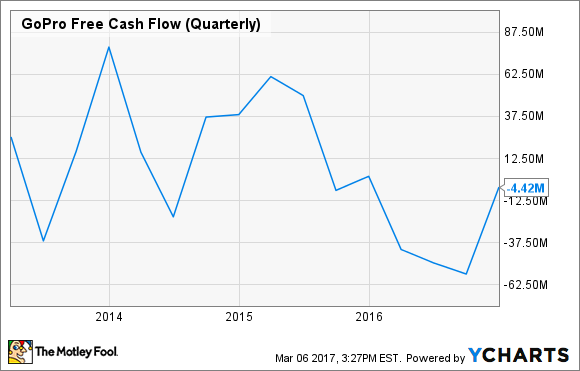 The analyst is also worried about cash flow, as GoPro continues to have negative free cash flow. GPRO Free Cash Flow (Quarterly) data by YCharts. GoPro is getting pinched by falling sales and increasing costs. Consider this snapshot of the company's income statement for the past two years. In terms of cash flow, GoPro swung from $157.6 million in positive operating cash flow in 2015 to a negative $107.8 million in 2016. It's worth noting that GoPro had not one, but two announced restructurings last year -- one in January and another in November -- that represent efforts to reduce operating expenses. As a result, the company expects non-GAAP operating expenses for 2017 to be about $650 million, or $735 million on a GAAP basis. Jankowski also notes that competition is intensifying, citing China-based YI Technology, which recently entered the action camera market and is also jumping into drones after scoring an investment from Xiaomi. YI Technology offers comparable products but undercuts GoPro by about $100. GoPro has done poorly at differentiating itself with software and services, a situation that is exacerbated by the November restructuring that eliminated its media division, and as such competes predominantly on hardware specs. The analyst also isn't optimistic about GoPro's ability to steal any drone market share away from market leader DJI. Yet GoPro still trades at an enterprise-value-to-sales ratio of 0.9, meaningfully higher than peers. If GoPro's financials continue to deteriorate, the company may be forced to draw on its credit facility, which goes up to $150 million. From the recently filed 10-K: "In March 2016, we entered into a credit agreement with a syndicate of banks that provides for a secured revolving credit facility under which we may borrow up to approximately $150 million as of December 31, 2016. No borrowings have been made from the credit facility to date." That money comes with strings attached in the form of financial covenants, such as maintaining a satisfactory fixed charge coverage ratio, among others. It won't be ideal, but GoPro might have to take on some debt.